Until recently, archeologists have thought of Neanderthals, an early relative of humans, as thick, slow thinking and likely uncreative. Now, new evidence dispels part of that image. Archeologists digging in the Netherlands have unearthed flint and bone fragments from 200,000 years ago that have remnants of red ochre on them, indicating that Neanderthals were using the material much earlier than was previously thought. The research team has published their findings in the Proceedings of the National Academy of Sciences. Ochre is a type of Earth pigment, which is a naturally tinted clay that has mineral oxides in it, and though they aren’t willing to say what purpose the red ochre (the type with iron oxide, also known as hematite in it, that gives it its red color) might have served, the team is relatively certain the material was not native to the local surroundings, meaning the Neanderthals would have had to find it at some other remote location and transport it back. Such effort implies that the material was clearly used for some purpose, which might have included its use as a pigment in creating artistic images on rocks or even on their bodies. 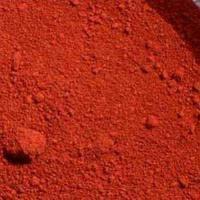 Modern hunter-gatherer peoples have also been seen to use red ochre as an insect repellant, as a means of preserving food, a type of medication and as a means of tanning hides. It’s not known of course if Neanderthals were involved in any of these activities. Neanderthal remains have been found in Europe and parts of central and western Asia. They lived during the Pleistocene epoch as early as 600,000-350,000 kya (thousand years ago) and are believed to have died out approximately 30 kya from unknown causes. The ochre material found by the team in the Netherlands is believed to date back 200-250 kya. Prior to this find use of manganese and iron oxide by Neanderthals had been seen only as recently as 60-40 kya (which has been interpreted as a use of pigments, though there is as yet no evidence to support such claims) thus the find pushes the use of ochre very far back in time. The team also notes that the time frame of the use of ochre by Neanderthals now coincides with the earliest use of ochre by Homo sapiens in Africa. The use of manganese and iron oxides by late Neandertals is well documented in Europe, especially for the period 60–40 kya. Such finds often have been interpreted as pigments even though their exact function is largely unknown. Here we report significantly older iron oxide finds that constitute the earliest documented use of red ochre by Neandertals. These finds were small concentrates of red material retrieved during excavations at Maastricht-Belvédère, The Netherlands. The excavations exposed a series of well-preserved flint artifact (and occasionally bone) scatters, formed in a river valley setting during a late Middle Pleistocene full interglacial period. Samples of the reddish material were submitted to various forms of analyses to study their physical properties. All analyses identified the red material as hematite. This is a nonlocal material that was imported to the site, possibly over dozens of kilometers. Identification of the Maastricht-Belvédère finds as hematite pushes the use of red ochre by (early) Neandertals back in time significantly, to minimally 200–250 kya (i.e., to the same time range as the early ochre use in the African record).